Growing up, my brothers ate all sorts of chips. Back then, the generic bags they went through daily just said: “CHIPS”… black on white. Maybe that was the turn off for me? Thankfully… they just didn’t appeal to me. Perhaps they just weren’t SWEET enough for my taste buds. Whatever the reason, unless it was an occasional Cheetos, or Doritos… or the phase with the “Baked Lays”… and the “secret ingredient” that made me sick to my stomach. Hmmm… maybe those WEREN’T so healthy. So I’ve done well when came to salty options… I just didn’t crave them – ever. 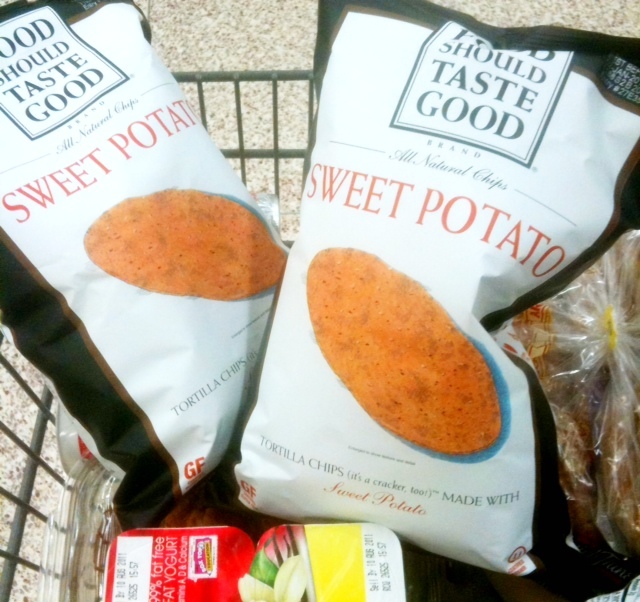 Then my loving husband introduced me to SWEET potato chips. “Oh, they have 20% of your Vitamin A…,” He said. Oh well… what could it hurt? I don’t really like chips anyway right? Well fantastic. I fell in *love* with them. Sweet potatoes – good. Sea salt – good. What’s not to love? Not quite all that and a bag of chips. It’s STILL a chip. But…. as far as chip options go, they are pretty yummy. Don’t blame ME if you get addicted! Posted on August 31, 2011, in Diet, Food To Try, Label Reading, Our Struggles, Truth. Bookmark the permalink. Leave a comment.